This article's title is not a result of a religious-sexual escapade in Washington. The Baptist babes are the Peasall (pronounced "peaa-saw" according to a press release on their website) and the White House is White House, Tennessee. Unsung heroines are these three - though they feature prominently, voice-wise if not onscreen, in the Coen Brothers' super hit movie, O BROTHER, WHERE ART THOU? The Peasall Sisters testify - literally and figuratively - that America has not thrown out decades of traditional music, that there remains a place for the family in music, and that religious belief is not wasted on the young. With Grammy and Country Music Association Awards and two CD's in their arsenal, Sarah (19), Hannah (16), and Leah (13) take on songs that pre-date them by centuries. They sing "Fair and Tender Ladies" and "Carrick Fergus," for example. The Carter Family is well-represented by "Keep on the Sunny Side" and the haunting "I Never Will Marry" (the feminine counterpart to Leadbelly's "Goodnight Irene"). Sometimes, the youth singing these songs might appear contrived - another gimmick to sell a CD. There is the infinite danger that this trio will become a one-trick pony; ChristianCinema.com already sells a documentary on the sisters - a suggestion that interest might be short-lived. The fact that these girls are very much a family does provide stability in the fickle world of music, and the family presence creates the harmony that Sarah, Hannah, and Leah have. The Peasalls remind the world that singing families multiply like rabbits in a birthing contest. If one adds the nod to homeschooling into the formula, then a person looks back to a time of the little red schoolhouse and the schoolmarm who taught every conceivable grade during the same time period. This musical family is also supported by their home church family - a First Baptist one, but a family nonetheless. The Peasall Sisters stand as a billboard announcing that families and music are virtually inseparable. These girls are not just Baptist - they are blatantly so. Their Christian religion is explicit and intentional. 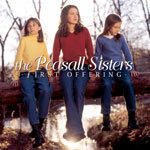 Their primary CD is entitled First Offering - in the Baptist denomination, that phrase has money/tithing attached to it. Many of the songs on their two CD's are traditional Southern Gospel-type songs heard practically in every worship building in the South: "When God Dips His Pen in My Heart" (a Cleveant Derricks tune), "The Old Account Was Settled Long Ago", and "Where No Stands Alone." The Peasall Sisters do not sing these songs because they are forced to by their parents; they sing these songs because they believe in God. Are the Peasall Sisters already an anachronism? There has been no new CD since 2005; these girls are devout Christians who will more than likely not be offered a record contract. They seem to be a novelty, noted for their beautiful voices in a movie, plus their youth keeps them from hitting a concert tour. The documentary Family Harmony came out not very long after their burst of fame and there's been little coverage since. Also, one must consider that these young women are being homeschooled - not exactly the type of environment for megastars to flourish. However, the Peasall Sisters might be the type of group who really does not find fame-seeking the reason for existence. They might be the kind of folks who have walked into the successful world of music and just enjoy singing in varied locations to the common man or woman. Maybe these three talents love their family and find comfort and meaning within its confines. Wouldn't that be amazing?